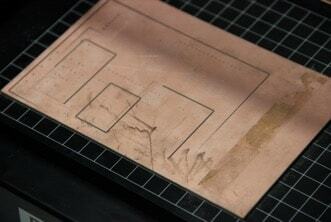 Follow this simple, short tutorial to make your own PCB using a milling machine. If you ever wanted to make PCBs of your own, and if you have access to a milling machine, then this tutorial will cover all the basics. This is a really simple and short tutorial that will help you start making PCBs using the Roland PCB milling machine (Roland Modela MDX-20). And you will be able to start making beautiful PCBs for your projects in no time :) This tutorial uses the Fab modules software bundle to send the design files to the PCB miller. 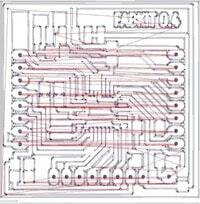 So check out the rest of the tutorial to get started on PCB milling. And if you want to use this machine and other cool fabrication equipments, check out the Fab Labs at Kochi and Trivandrum that have been recently setup by MIT. Also if you want to make your PCBs by hand, you can also check out this tutorial on how to make PCB at home. The Modela is a highly powerful CNC, it can occasionally result in a lot of flying debris in the form of dust or small board pieces. Always wear safety goggles while operating the machine. And also never touch the drill bit or place your hands near the board while the spindle is active. The Green power button, well controls the power. View, moves the cutting head away and the base plate towards you so that you can place/see your cutting surface. Tool Up, moves the cutting head up. Tool Down, moves the cutting head down. We will be using a copper clad board as our sacrificial layer. We need a sacrificial layer here because in case something goes wrong and the milling bit goes further than expected, we might just end up damaging the base plate. The sacrificial layer as the name suggests sacrifices itself for saving the base plate from any damage. 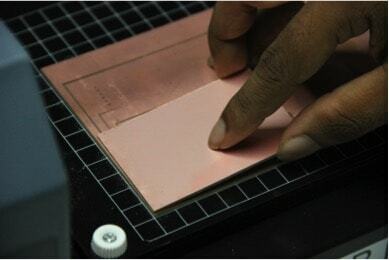 To do this we apply the dual sided tape onto a copper clad board, about the same or of greater size to that of the plate we are going to mill. This would also help us when we are cutting the final board out. Make sure that when you place the board on the build plate you leave a 1 sqcm border. Make sure that the board is level and apply sufficient force above it to make it adhere to the base plate. Now, place the board on the sacrificial layer, leaving a 1 sqcm border like before. And now gently apply pressure on the board so that the board adheres to the sacrificial layer. Observe the milling surface to see if its level. If not try applying pressure gently on the raised areas, if that doesn’t work redo the adhesive part, making sure that its level and uniformly distributed. Once that’s done, your milling surface is ready. 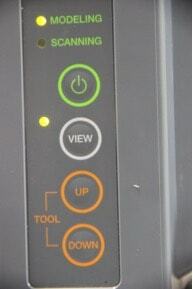 Raise the milling head by using the ‘Tool-UP’ button on the Modela front panel. Using the Allen key, gently loosen the hex nut on the rotating part on the milling head, and gently remove the existing bit. Depending on the type of cut you wish to make you will have to select from 2 available bits. 1/64 for the traces and 1/32 for the border cut. Make sure, while storing a bit, it should be placed in its appropriate container with the cap on. There are two ways you could use this milling machine, either by using the offline ‘fab’ package, or the online fabmodules.org website. 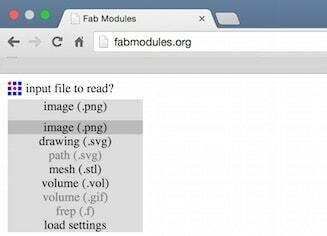 We will be using the Fab Modules website for this tutorial, but both the methods are pretty much the same. There is also an offline version of the tutorial. 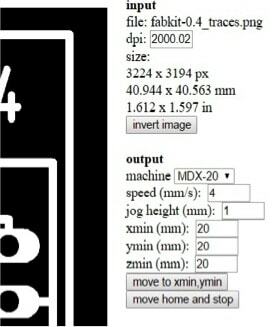 Select ‘input format’ and then from the corresponding drop down, select image(.png). And Load your PCB trace from your local storage. Note that the image should be in black and white, not color, not greyscale, but black and white. Where the white part determines your circuit. (You can always invert the image by clicking on the ‘invert image’ button if you require. Under the output format drop down select the ‘Roland Mill (.rml)’ option. Next, you need to set the origin for the PCB miller or CNC. This is done so that the machine knows from where it should start the operation. 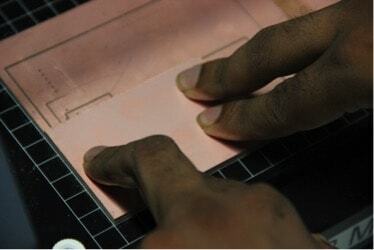 This is also vital in order to select the desired area on the copper board on which you want the PCB to be made. Select the ‘move to xmin, ymin’ option. This would move the milling head to the Zero by default at 20mm, 20mm, you can play around with these values. Now move the milling head down by using the ‘Tool-Down’ button on the front panel, till you reach about 0.5 cms above the milling surface. Now with the Allen key, gently loosen the hex-nut holding the bit such that the bit drops to the milling surface. Then fasten the nut. Now the milling bit should be resting just on the top of the milling surface, as seen in the image. Select the ‘PCB traces’ option under the ‘process’ drop down. As seen above. In the fab modules adjust the cut depth to about 0.2-0.4mm, that seems to work great for me, but feel free to play around with it, since we have a sacrificial layer. 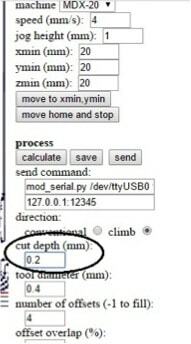 Now you could either make modifications to this and calculate again, and once you are happy with what you see, click the ‘send’ button as seen above.As soon as you send the tool path to the device, it should start cutting. Be patient and wait till the entire cut has been finished. But wait! Don’t remove the milled board just yet. 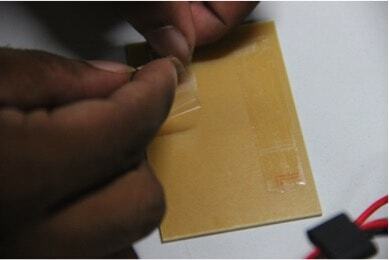 Vacuum the surface and then closely observe the circuit and note the surface for any incomplete cuts. Incomplete traces should look like the shiny grooves on the above image. 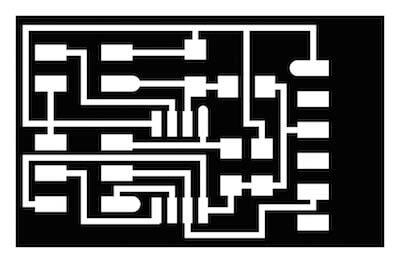 If so redo the entire circuit with a little more cut depth. The milling bit might break off during operation, it’s always recommended to wear eye protection while. Always vacuum the surface after cutting before operation and upon finishing. The Moving cutting head can jam your hand between it and the enclosure, keep your hands away from the cutting area, when under operation. If the bit doesn’t fall off upon loosening the hex-nut, try gently rotating the milling head. If the device starts acting weirdly, switch off the mains supply and then turn it on. 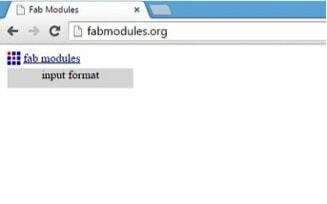 If the fabmodules site doesn’t work, make sure that you are not running both fab and fabmodules together. Try logging off then logging on. Open up terminal and type in ‘mod_serve’ and keep the terminal session up.